A couple of fellow LTHers have expressed interest in trying the Italian-style cornbread that they make at the Italian Superior Bakery. 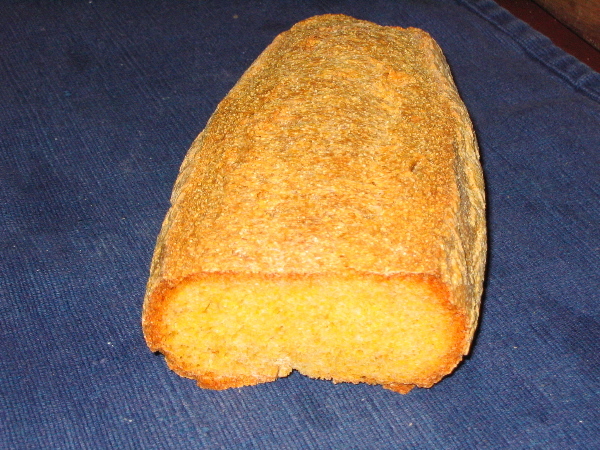 It is an unsweetened bread with a nice corn flavour and a special texture. Since the demand is no longer great, Frank Masi only makes it if someone orders it. Now, these days, while Frank still oversees all the morning bakes, he works the evening dough-making session only on Wednesdays and since he is the one who knows how to make the cornbread, the only practical time to get the stuff fresh out of the oven is on a Thursday. I plan on ordering a loaf for next Thursday, 10 March. Is there anyone else who would want to order a loaf and be able to pick it up that day? I should give the bakery a list with names and number of loaves per pick-up so they can keep track of things. Unbeknowneth had the foresight to give me his real first name in a p.m. which will seem far less exotic to the Masi's on the list I give them. Anyone else who has a particularly colourful LTH-handle might want to do likewise -- first name alone would suffice, perhaps with a second initial. At the moment (10 a.m., Tuesday, 8 March), I have the following list of orders (please notify me if I have anything wrong or have left something out). If for some reason you have changed your mind about ordering or won't be able to pick the bread up, let me know. It would be bad form to leave the bakery with a large amount of cornbread and little likelihood of being able to sell it to casual walk-in business. That's a total of 20 at the moment. I should check with you all to get an idea of how many would be picking the bread up at the earliest time it would be available, that is, ca. 7 a.m. Frank can do it all for then if everyone is coming early, otherwise he'll split the baking up. He's flexible, so just let me know. I have the impression that the three multiple orders would all be in the early range, no? Again, if there are any questions about or problems with picking the bread up, feel free to contact me. If you're changing your order, let me know before lunch tomorrow, as I will need to turn the order in to Frank tomorrow afternoon. If on Thursday you have any questions or problems regarding pick-up, it would do well to call the bakery directly; the phone number appears again below along with the address. I'll post a final update tomorrow. P.S. One of you enquired regarding the price per (pound) loaf. Masi's basic breads are $1.90 per pound loaf; I would be surprised if the cornbread price differed significantly. I'll try to remember to ask Frank or Joe about this and will post the price if it is much more than the price just cited. Well I picked up my loaf and leesh's 2 loaves at ~7:15 this morning. Oh my goodness what a wonderful way to start the day by sampling the sweet bouquet of freshly baked bread! I had the pleasure of meeting Antonius and CrazyC in person which was another nice start to the day. Driving my wife up to her office it was quite difficult to resist tearing in to the still warm bread . . . but discipline prevailed (good thing, too, when considering traffic and driving patterns in the Gold Coast). It's also good I resisted as had I eaten some I might not have been willing to part with the 2 loaves I picked up for leesh. Once safely at the office I sliced up some to share with friends. <insert visual image of man smacking forehead> Why did I only order one loaf? I love the texture and taste of this! Really good stuff, thanks again Antonius for your efforts on this. I hope that Frank is happy with the turnout and demand for this fine product of his baking skills and I look forward to more of these loaves in my future. Now that people have picked up this bread, maybe someone could offer a description of what the bread is like. Is it a traditional southern cornbread, or is it a loaf of Italian style bread that is somehow corn flavor? Having eaten half my loaf already, I can answer that. It's a yeast bread, but made, I would guess, primarily (though surely not exclusively) with corn meal instead of wheat flour. The taste is very much like a southern-style not-sweet cornbread, but obviously with a very different texture. It's very good. stevez wrote: Now that people have picked up this bread, maybe someone could offer a description of what the bread is like. Is it a traditional southern cornbread, or is it a loaf of Italian style bread that is somehow corn flavor? I mention briefly at the beginning of this thread and describe in a little more detail somewhere in the long post what this bread is. It is not American style cornbread, rather it is Italian cornbread. Completely unsweetened, roughly half corn meal and half white wheat flour, shortened slightly with a touch of butter. I got an extra crisp loaf and just had a slice. Again, no sweetness aside from what develops naturally from the grains used, a pronounced corn flavour, and a nicely textured crumb. I can well imagine that not every one will love it but I think folks who like the flavour of corn probably will. I remember ReneG saying he particularly likes Masi's cornbread and I concur -- it's very tasty and a nice change of pace. I hope everyone who ordered some today is well pleased with it. thanks again to antonious for arranging the baking of the loaves, and to k-man for delivering (and not devouring my loaves!). What a wonderful, dense loaf of bread. I definately love the corn texture - and as i didn't get mine until about 11am, I used our bread oven to heat my loaf up. warm slices, spread with sweet cream butter, all I can say is, in the words of homer simpson, gaaaaaaa.... (imagine head back, mouth drooling)! Thanks for the explainiation. I guess I read this in your original manifesto, but just didn't remembert. The bread sound great. I think I want to get in on the next round of corn bread ordering. P.S. Is the fact that it comes from the new world the reason you don't spell it courn? Thanks A&A (Ann and Antonius). I picked up a loaf of corn and a loaf of regular bread at Ann's house this morning. Soon afterwards, I nabbed the heels off of both loaves. Excellent, really exellent, and surely in the top tier of Chicago breaderies. Both loaves have crusts about 5 mm thick and as hard as space-age carbon fibers. The corn bread tastes nothing like Southern corn bread, as it is much drier, but neither does it have an excessive coarse crumb that I feared. Thanks again for setting this up. The bread is absolutely wonderful. The description "dense" is accurate though it shouldn't turn people off. This is not a heavy or chewy bread, neither excessively moist or excessively dried out as many "dense" breads can be. American style cornbread too often suffers from these faults - wet and heavy or dry and crumbling without any structural integrity. The crumb here is not crumbly. For me the real pleasure after crunching through the crust is the granular way the bread breaks down, the sense that the heart of the grain is there, elemental. It's basic, not hidden, in the same way that corn is exposed in good polenta, tamales, and crisp tortillas. Not to get too philosophical, but there's something really great about the way an ingredient can both stand out on its own and also amplify the whole ... which is, in a way, a central tenet of so much Italian cusine. Antonious mentioned an extra-crisp loaf. I have to try that next time. The crust on the regular loaves is pleasantly thick and uniform with nice crispness. The thickness keeps it from being brittle or flakey. I would be interested in seeing how the added crispness affects the crust, the transition from crust to crumb, and the color. Which reminds me; this is not a pretty loaf. In fact, when I saw the bread being carried to the counter, it's appearance was inauspicious. The color is matte, off white, with very little corn yellow. In terms of height, it is rather flat with almost no contour where the loaf was sliced down the center. It reminded me of breads that I've made from heavy grains that didn't rise sufficiently, turning out heavy, with no give. When it was handed over to me, it gave under a slight squeeze. The brown bag was warm, radiating heat for a good half hour, and the smell was bakery rich. I'd go so far as to say that all of Masi's breads are a bit homely. This is not a slight and definitely not a reason to eschew these fabulous breads. It is just an observation. Industrial breads, like industrial fruits, have been engineered to endure, to shelve well, the accept abuse, to look shiny and racy, to get at the salivary glands through the eyes, to disappoint every sense but vision. Of course, there are beautiful breads that taste incredible as well. I can't imagine truly great baguette or brioche being ugly. But the phenotype/genotype of Masi's products is rustic stock ... not faux-rustic, shabby chic, under the Tuscan sun rustic, but the real deal. Appearance belies the bread's quality. Ann Fisher transported two loaves of granturco and one of wheat back for me, and they were both exceptionally enjoyable: dense, and yet moist, full of flavor and personality. I gave one loaf of granturco to my Italian tutor, whose eyes got big with happiness when she bit into a chunk that she immediately ripped off the loaf as soon as I presented it to her. Thanks again, and I hope it wasn't too much of a hassle for you to coordinate all of this. Give me a call later and I will give you a half a loaf, which will be better than none. I picked up three, gave one to a restaurateur friend, who, after one bite, immediately asked the name of the bakery and started to think of ways to introduce the bread into his menu. I also bought a 'standard' Italian loaf, quite wonderful as well. This is great bread, thanks again Antonious. To all those who have written in to thank me, I say that it was a pleasure helping to facilitate you all having a chance to try this interesting cornbread. In turn, I must thank Joe and Sam Masi and especially Frank Masi, for letting me invade their place of work and watch them produce their bread. As it turned out, I stopped by yesterday to drop off the order list and watch Frank make the cornbread dough. One of the guys who works there didn't make it and Frank 'pressed' me into service -- I'm sure he could tell I really wanted to help out. And so I did help out a bit, shlepping and scooping mostly, but I also got to roll the weighed chunks of dough into balls. In doing so, it suddenly occurred to me how much the cornbread dough feels like the semolina dough I make when making the traditional southern Italian eggless pasta. I imagine the similarity struck many Italians when they were first introduced to the exotic 'grain of the Turk'. When I asked this morning, "how long have you been here?" you knew I was directing the question at you. But Frank thought I was talking to him, and said "since 1933" and that got us talking so I never found out how long you'd been there. So are we to understand that you were there all night? You've also been holding back on showing us a photo of that scale, which has to be one of the best sights there. You may be interested to know that your good deed inspired others. I invited the people I was picking up bread for to make a donation to the AIDS Legal Council (my employer) instead of paying me for the bread. We ended up with $215. Thanks Pyschchef, sdritz, rich4, Hammond, and VI! I regret not being able to get a loaf of this bread. The taste sounds like the water cornbread of Appalachia, which I love. 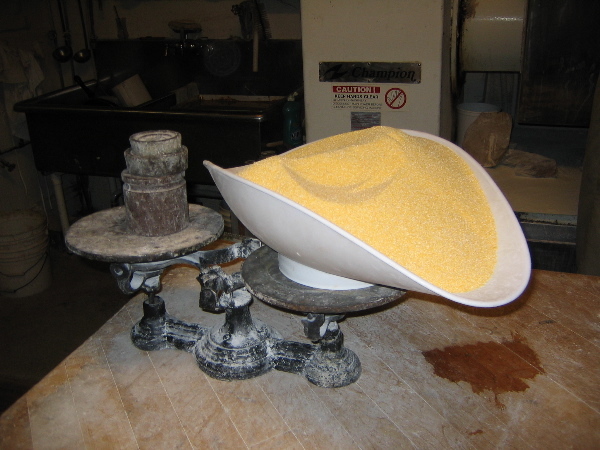 There it is usually made with white cornmeal. Cucina povera, in many small towns in Appalachia you can still get a "vegetable plate," cheaper than the other regular combos, and cheaper as well. One of the two best hash browned potatoes came on such a plate. In that part of the country, in the fall, they (local vendors) also advertise fresh pintos. We drove, parked, walked all the way to the top of the Cumberland Gap and literally could not see beyond our arms, the fog was that thick. But the potatoes, fresh pintos, and a non-sweet cornbread on the road down made it all worthwhile. I failed to mention above that I really enjoyed meeting for the first time several fellow LTHers this morning (Ann F., CrazyC, Kman, Rien, Unbeknownth), as well as getting to hang out a little while with Gary before having to head off from the bakery. Annieb, Stevez and any others interested in trying the cornbread: I'll probably put in another order in a few weeks and, seeing as things seemed to work out well for all concerned today, I'll post a note again here. Of course, anyone can place an order but for cornbread, as I mentioned somewhere, it pretty much needs to be an order placed on a Wednesday for pick up on the Thursday. For me, it was my first experience with a yeast risen cornbread. Certainly it wasn't sweet, but it wasn't dull to me like unsweetened quick-rising cornbread always seems. When Charlotte brought my loaves, I shared samples with everyone who lunched at Prairie Joe's in Evanston today. It really had a very good chew where eventually you could feel the dried bits of ground corn. For a light dinner tonight I had Butterbrot: I toasted slices, lightly buttered then topped with an Irish cheddar-type cheese along with hot tea. For whatever it matters, I thought the loaves were very attractive. Thanks for the taste, Cathy. I think I'll be trying yeast on my next batch of cornbread here. I must tip my cap again to Antonius for going even further "above and beyond" upon realizing that he pitched in to assist with the preparation of these fine loaves. When I entered the shop this morning shortly after 7 AM I was the lone person at the front of the shop. I observed the activity in the back with Frank Masi removing loaves from the oven and just patiently waited while enjoying the wonderful smell of fresh bread. Eventually one of the men in the back asked what I was there for and - as his shirt had a healthy dusting of flour - I assumed he was one of the bakers (I mean, who else would be in the back of a bakery at dawn covered with flour?). When I responded that I was there to pick up some loaves of corn bread and that "Tony" (taken from a previous post of how the Masi's responded to an inquiry about Antonius) had set up a group buy "Tony" responded that he was indeed Antonius. As much as I appreciated the efforts that Antonius invested in making this event happen I am simply blown away that he ended up assisting with the actual baking. I look forward to being able to buy you numerous libations of your choice in some future meeting where you aren't pressed into food preparation service (or even if you are!). I picked up my loaf from Ann Fisher's office this afternoon and couldn't resist peeking at it throughout the afternoon. I successfully resisted tearing into it before dinner tonight. It exceeded my expectations. My husband and daughters loved it, and my oldest daughter asked if we could get more. I'm glad to hear Antonius is willing to order again in a few weeks, because the entire loaf is gone. We hope to visit the bakery in person early on a Saturday morning in the near future and try some of their other fresh offerings. Thank you again, Antonius and Ann, for making it possible for me to try this!! And Ann, I think you may have hit on a new fundraising gimmick for your very worthy cause! Cathy thanks for the cornbread. It was great! I also got a taste of cornbread today thanks to GWiv. Even though it was a day old and only half a loaf (hey wait...am I in a Dickens story?) the bread was quite enjoyable with some butter and sea salt as others have recommended. Someone remarked earlier in this thread about how the corn bread reminded them of Jewish Corn Rye. I agree with that statement. The bread was very much evocative of that treat...of course without the rye component. Just wanted to note (much past the heyday of this thread) that Kaufman's in Skokie has Jewish-style corn bread. I've never had it but now will make an effort to try it.